These Leading Brands Of Large Chest Freezers Save You Time And Money! 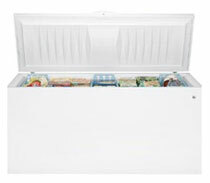 As a rule of thumb, large chest freezers have capacities of more than 18 cubic feet. It's a great investment choice for your large family as it enables you to shop for perishables such as vegetables and meats less frequently. If you value home-cooked food but only cook occasionally, you will tend to "eat out of the freezer." This means that you will require a larger freezer than you would if you cooked more often. It enables you to store bulky foods such as animal carcasses, while leaving sufficient space for your usual freezing needs. 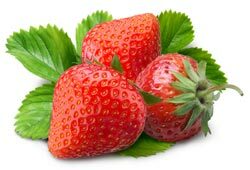 It enables you to freeze seasonal veggies and summer fruits (such as strawberries) for consumption during winter. If a large chest freezer seems to be way too big for your needs, be sure to check out our reviews of our top-rated compact chest freezers whose capacities range from just over 1 to 5 cu ft.
You could also visit our page on small chest freezers that reviews models with capacities of 6 to 9 cu ft or the page on chest freezers that covers medium-size models and covers freezers with capacities of 12 to 18 cu ft. It offers frozen storage capacity of 21.7 cubic foot, enough to cater for the largest of families. Like most freezers, the Whirlpool has a one-year limited warranty against manufacturer’s defects. Its yearly energy consumption is only 460 kWh. This works out to an annual energy bill of $49 or just around $4.08 a month. This is one of the lowest in this class of freezers. A manual temperature knob empowers you to adjust the temperature of your frozen food as needed. Wraparound coils and evaporators on all sides and corners of this large chest freezer help to keep internal temperatures stable by preventing warm spots, thereby ensuring that your food is evenly frozen. A power on light gives you peace of mind that your freezer is receiving power and that your food is safe. A temperature alarm audibly alerts you when conditions are sub-optimal. Interior lighting makes it easy to find and retrieve your food items. A defrost water drain is on the front for easy access and takes the tedium out of that exercise we all have cold feet about. 3 slide-out storage baskets make food organization a snap. This 21.7 cu ft chest freezer allows a large family to shop in bulk, paying for itself in a matter of months rather than years. Interior lighting illuminates even the furthest corners of this large chest freezer so you don’t spend too much time searching for your food. 3 lift out storage baskets enable you to organize your frozen items so that they are easy to find, even in this large chest freezer. An exterior power on light shows you that the unit is operating and that as far as your frozen food items are concerned, all is well. The defrost drain is located on the front panel to simplify removing leftover water after completing the manual defrosting exercise. The cabinet liner is smooth and easy to clean. It is also rust and impact resistant, assuring you of many years of dependable service. Solid core foam insulation muffles noise, ensuring that this freezer operates extremely quietly. Plus, this insulation helps to keep the cold air inside and your food frozen, not thawing away in the freezer. 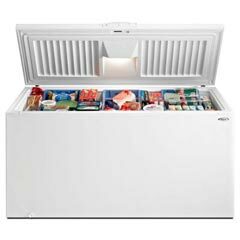 With approximate dimensions (HxWxD) of 35 in x 73 1/4 in x 29 1/2 in and a humongous frozen storage capacity of 24.9 cubic feet, this extra large chest freezer gobbles up everything you throw at it. 5 lift out/sliding trays make it easy to store and find anything inside this freezer. A bright interior light means you can see into every nook and corner. So, no need to do gymnastics to find that packet of carrots that you tossed into the freezer a fortnight ago. The estimated annual energy expenditure for this freezer is $60. This translates into a monthly energy bill of just $5. The white textured steel exterior and lid give it a classy look that make it a worthy addition to a large, light color themed kitchen. This finish also makes this large freezer easy to clean and, it won’t show smudges or fingerprints. There’s foam insulation all around the cabinet to conserve cold air and to ensure the unit operates quietly. To crown the above benefits, wraparound coils and condensers ensure that cold comes into the freezer from every direction, with no gaps that let warm spots form to spoil your food (and your mood). 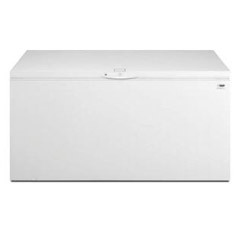 This 24.6 cu ft Frigidaire chest freezer measures around 73-1/4" W x 29-1/2" D x 35" H. So you can be sure that you will have sufficient cold storage for your bulk purchases. Because this large freezer is Energy Star rated, it will help you keep a tight rein on your utility bills. In fact the model has an annual energy cost estimate of $54, which works out to less than $5 each month. Plus, because it is an Energy Star, it may be eligible for rebates from your local utility company so be sure to explore this possibility further. The manual temperature dial does a good job of keeping the interior temperature between -10° to +10° Fahrenheit, depending on your setting. A lift out storage basket is a great place to store frequently used items which require to be quickly retrieved, such as crashed ginger and garlic. Frigidaire’s exclusive SpaceWise Organization System comes as a standard feature. This includes dividers and pre-printed labels to help you organize your food. There’s a powerful interior light that makes it easy to find tiny frozen items in dimly lit rooms. An exterior power on light gives you the peace of mind that comes from knowing that your unit is properly powered and that your frozen food investment is safe. A manual drain helps to channel the waste water, somewhat taking the sting out of the often dreaded defrosting exercise. A 5-foot power cord gives you some flexibility on positioning the unit as it does not have to be located right next to a power outlet. Frigidaire designs and manufactures this freezer entirely in the United States so opting for this freezer is a great way to help pull the American economy out of the clutches of recession. Reliable large freezers are a great way to save time and money by shopping in bulk, less often. Plus because the growing seasons are tight, a large chest enables you to stock up enough peas, corn and summer berries to last you through winter.